The pony car seems to be expanding its legacy into the future with its new and innovative Camaro V8 Coupe 2016. The Chevrolet Camaro V8 Coupe 2016 comes with innovative hardware conjugated with a 4 cylinder turbo charged engine. It’s the sixth time, Camaro has come in a direct battle with Ford Mustang, the pony car’s local rival. The new model doesn’t seem to be straying away from its classic formula. The apparent styling resembles the models sold from the years 2010 to 2015. However, what goes on under its skin and beneath its hood is quite different. It now deploys, GM’s Alpha architecture, which implies that it not only has a lot in common with Cadillac’s CTS and ATS but it is also the hi time for us to stop labelling Camaro as a muscle car. The performance profile of the V8 Coupe is much more advanced. It leaves behind the previous Camaros as far as the performance is concerned. With this 2016 Coupe, Camaro enters an entirely new and different realm. As stated above, the styling is not very innovative and original and at first glance you may not be able to identify it as a new model. It just seems to be a tad smaller with slight adjustments in its proportions. Its looks do not strike one as mesmerizing or lyrical however whatever shortcomings the fifth generation Camaro had, such as its awkward passages or sharpness, the 6th generation models seem to have recovered from them. Your impressions of Camaro’s styling is greatly determined by the angle of approach that you choose. When you look at it from the sides, the details might appear to be well-defined and well-honed. However, it might give a stubby appearance when approached from any other angle. Camaro’s characteristic haunches have made their way into the 2016 model as well, thus counter-balancing its nose and grille which otherwise may have looked awkward. 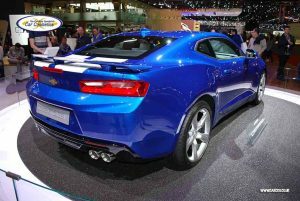 The cabin of Chevrolet Camaro V8 Coupe 2016 is again a departure from tradition, rather a more obvious departure, and we would take the liberty of asserting that this modification in the cabin’s model is for the best. The last generation models had a characteristic thrifty feeling. In this new coupe though, this thriftiness has been done with. Some other odds and ends which had been passed along from generation to generation have also been wisely chucked away since they did not seem to be complying with the demands of a modern environment. The cockpit appears to be more modern, more cohesive and manufactured from better materials. The seams are fewer as compared to previous models and the cohesive outlook makes it possible for digital gauges and gadgets to blend in this ambience. Air vents that circle around the climate controls also have a contemporary feel to them and seem to be catering to modern demands. Chevrolet Camaro V8 Coupe 2016 is the first generation of Camaro to be powered by a turbo-charged 4 cylinder engine. It can produce around 275bhp with a torque of 295 lb. ft. Chevrolet claims that this power would be ample to get the get the car flying from 0 to 60 mph in just a matter of 5.5 seconds. It might not be as powerful as its contemporaries but still it is pretty fuel-efficient. General Motors have claimed that its mpg would measure up to 30 once the ETS has subjected it to their standardized tests. This might make it comparable to Mustang Ecoboost. Ecoboost is considered to be the most fuel-efficient vehicle in the Mustang range with a 31 mpg when driven manually and a 32 mpg when driven automatically. This is followed by Camaro V6 which is powerful enough to crank out 335hp but the best in range is the V8 Camaro which successfully pushes out 455bhp and 445 lb. ft. torque. It is quite fast and requires merely 4.3 seconds to get to 60 mph from 0. All of these models can be handled with either a 6-speed manual transmission box or an 8 speed automatic one fitted with paddle shifters. Overall it can be asserted quite confidently that even a midrange model of Camaro Coup 2016 would beat the best performance Camaros of a few generations ago. No matter what powertrain combination you might opt for, you can customize the Camaro to your individualistic driving styles and preferences. This is made possible by an innovative feature termed as the Drive Mode Selector. This feature would enable the drivers to burnish their driving by adapting and adjusting features such as the car’s stability controls, its throttle progressions, its steering etc. You can opt for either Sport Mode or Tour Mode depending on the setting of your Track. Chevrolet gives you the option to freely play with these settings and to devise your individual drive mode catering to your individualistic preferences. The suspension is double-pivoted and the electrically powered steering is also standard for the Chevrolet. The brakes which work with four pistons are also standard, and so are the 20 inches tires on the SS model. 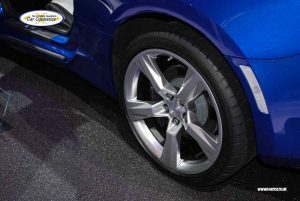 However the LT Camaro comes with a customizable option of Eagle F1 run-flat tires. These innovations and magnetic dampers enable Camaro 2016 to strip off its muscle-car stereotype. The Camaro SS is a sports car to its core which skims down pavements instead of pummeling down. Moreover, it is extremely responsive. As a matter of fact, this responsiveness was lacking in all previous Camaro generation models except only the best ones. Its light weight grip and its downsized chassis is mainly responsible for Camaro’s sound handling and excellent grip. It has now joined General Motor’s family of Alpha cars which also accounts for these welcome changes and modifications. This change of platform has resulted in a decrease of approximately 200 pounds. However that being said, the car’s body design and its suspension are the two crucial factors which have enabled it to improve its handling while retaining its classical heritage to a certain degree. Despite this fact, these improvements have still not helped in stepping up Camaro’s accommodational value. Its rear seats do not have much space and may only be able to accommodate only two passengers. The front seats though are more comfortable and the cockpit is very well organized. In fact, no other previous generation of Camaro cars have had such comfortable or organized cockpits. 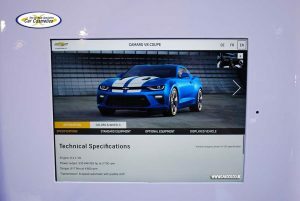 So far Camaro 2016 coupe has not been subjected to any standardized tests and therefore no crash data has been rendered available. This is because Camaro 2016 has been introduced very recently in the industry. However, even the previous versions of Camaro have performed quite well in tests. Therefore, it is expected that this new coupe would score even higher owing to the multitude of innovative features which have been added to it such as the rearview camera, collision warnings, monitors taking care of blind spots and many other technological safety features. Optional parking sensors are also available which are indeed much needed. Other additional features include locks, mirrors and power windows. A myriad of infotainment options is also available such as audio streaming, blue tooth, AM/FM, touchscreen, two USB ports, six speakers, hardware compatible with 4G LTE, power seats, cruise control, ignition without key, standard 18 inch wheels and a selection of customizable driver modes. 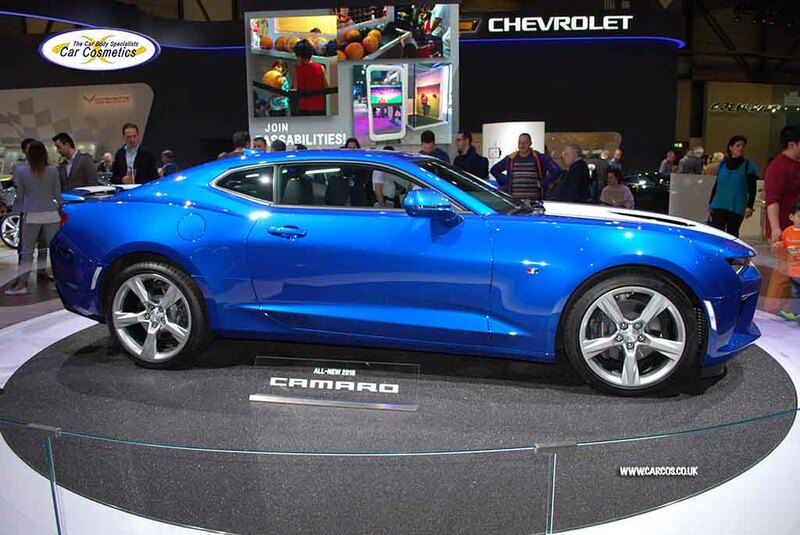 Chevrolet Camaro V8 Coupe 2016 is also budget-friendly and comes at a reasonable price tag. The price range starts from £34,995 and may go up to £39,995. Moreover, it also offers extra packages that are optional to step up the appearance or performance of your car. These options include a head-up display, leather upholstery and a thermal steering wheel. There is a Brake package which helps you maneuver easily on a Track Day. Similarly, when this brake package is conjugated with specialized 20 inches wheels, it offers Brembo brakes with four pistons, superadded with performance pads. It also contains additional coolers for your engine oil. 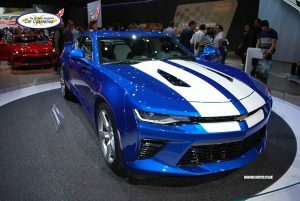 The Chevrolet Camaro V8 Coupe 2016 is different on so many levels from the previous fifth generation cars, however initially it may resemble the previous models greatly. Or you may think that the fifth generation Camaro model has walked out of a personal trainer’s office after benefitting from the services of a stylist consultant. However, once the very familiar metal sheet has been lifted off, you would come across a platform which is unique and innovative to its core. The Alpha underpinnings have revolutionized its working and now it has much in common with the entry level Cadillacs. This new platform is conjugated with considerable loss in its weight and an upgrade in both its interior design as well as the quality of the deployed materials. Let’s now have a glimpse of the review’s summary. The exterior styling isn’t much different from the previous generation models. The rear seats seem skimpy. The turbo four still has to establish its worth. Car Polish and Wax, What is the Difference? Car Polish and T-Cut, What’s the differences?